Two of the most eye-catching measures in yesterday's budget were help for first time buyers in the form of a new 'help to Buy' ISA and the announcement that the first £1000 in savings income will now be tax free. Our reporter Zoe Conway reports from Gloucester to find out what people there make of the Budget. There are reports that the so-called Islamic state is using the dark web, the area of the internet that traditional search engines cannot see nor retrieve content in the deep web. Using anonymous, untraceable networks the deep web can conceal a user's location and usage from anyone conducting network surveillance or traffic analysis, making it more difficult for Internet activity to be traced back to the user, making it a perfect place for the terrorists to share information undetected. Frank Gardner is a BBC security correspondent. On Tuesday’s programme we invited listeners to send us their 'Happy Songs' ahead of Friday's United Nations International Day of Happiness. We were swamped with suggestions on email and twitter. Over the next couple of days we thought it might be interesting to hear what songs lift the spirits in different countries starting with China. Lowering the voting age has long been debated in this country and came to pass last year for the Scottish independence referendum. So how do those sixteen and seventeen year olds feel now they're being told they are too young to vote in the General Election? 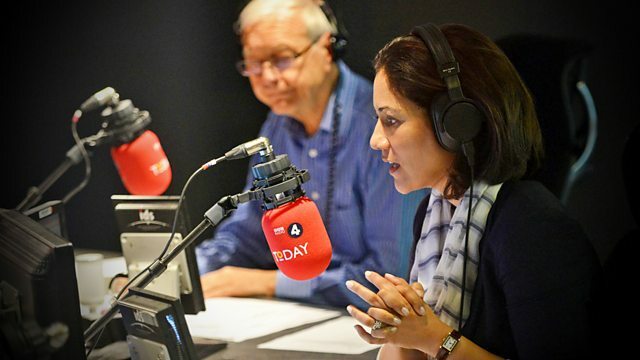 It's something we wanted to look into on the BBC News School Report day, when pupils from around the country are becoming journalists for a day. As part of our coverage of 100 constituencies in 100 days, we hear from the School Reporters from Merns Castle High School, near Glasgow - part of the East Renfrewshire constituency. Yesterday the Chancellor delivered a deeply political Budget seven weeks ahead of the general election, offering financial goodies to taxpayers, savers, home-buyers and the regions of Britain, while doing his best to blunt Labour's lines of attack in what is expected to be the most tightly-fought campaign of modern times. What is Labour’s response? Ed Balls is Shadow Chancellor of the Exchequer. A study published today on the Journal of Experimental Biology says orang-utans use their hands to alter their voices - making themselves sound bigger by cupping their mouths when they call. The researchers say that if the animals are deliberately changing their voices to exaggerate their size, this could shed new light on the evolution of human language. Adriano Lameira is one of the authors of the report and a researcher at Liverpool John Moores University. The President of Tunisia has said his country is at war with terrorism after gunmen killed seventeen foreign tourists and two local people at a museum in Tunis. Police in Tunis are searching for accomplices of the gunmen who killed at least nineteen tourists yesterday. Busloads of sightseers were arriving at the Bardo museum in Tunis – which adjoins the country's Parliament -- when men armed with assault rifles opened fire. Security forces ended the siege several hours later, killing two gunmen and freeing hundreds of people trapped inside. Polish, Italian, German and Spanish tourists were among the dead. A police officer and a Tunisian national were also killed. Saida Ounissi is a Turkish MP for the moderate Islamist Ennahdha party, she was inside the Tunisian parliament when the attack took place. Will George Osborne’s last budget of this Parliament do enough to persuade voters to back the Conservatives at the general election? The Chancellor declared that it takes Britain "one more big step on the road from austerity to prosperity". At the heart of the statement is what Mr Osborne called a "savings revolution" - including the creation of a new tax-free savings account for first-time home buyers and an announcement that most savers would no longer pay tax on interest on their deposits. The Chancellor told MPs that the squeeze on public spending would end a year earlier than planned - in 2019, and that growth forecasts had been revised upwards. But for all the ‘feel good’ rhetoric of yesterday’s statement, which was devoid of big election giveaways, do people feel optimistic about their own prospects? George Osborne is Chancellor of the Exchequer. On Tuesday’s programme we invited listeners to send us their 'Happy Songs' ahead of Friday's United Nations International Day of Happiness (See 0720). Here are happy songs from Italy. With a surprise victory for hawkish Israeli Prime Minister Benjamin Netanyahu, questions are now being asked about what this means for its future relationship with its Middle East neighbours. Moshe La’alon is the Israeli Defence Minister. What are the chances that a child from an ethnic minority group growing up on a council estate in the Midlands will end up at the very top of an international private equity firm? Not particularly high - and according to some measures of social mobility - even less now than would have been the case 20 years ago. Today is BBC School Report Day - when youngsters around the country are making their own news reports with a bit of help from the BBC. One group of School Reporters in Leicester decided to invite Damon Buffini, boss of the private equity firm Permira, back to his home town to speak to them. Sima Kotecha went along to Rushey Mead School in Leicester. Will George Osborne’s last budget of this Parliament do enough to persuade voters to back the Conservatives at the general election (See 0810)? James Landale is the BBC’s Deputy Political Editor and Robert Peston is the BBC’s Economics Editor. The French Government is trying to prevent regional violent jihadi groups forming alliances in Northern Africa. France already has security commitments in Niger and Chad, as well as in Mali, where it led an offensive against jihadi groups linked to al-Qaeda. Now it has set up a base in Madama in northern Niger. Our West Africa correspondent Thomas Fessy, has been to see it. Tomorrow a total eclipse of the Sun will take place, visible from the North Atlantic Ocean. Observers in the UK and Ireland will see a partial solar eclipse, with up to 97% of the Sun blocked out. This will be the deepest eclipse in the UK since 1999. And be warned, you won’t have another chance to see anything like it until 2026. Professor Brian Cox and Dr Sheila Kanani, Education, Outreach and Diversity Officer of the Royal Astronomical Society.